To quickly change the memory modules in the laptop, we must first find out where are the slots. Then remove the lid and just add a new module. Or change the old to the new memory modules. 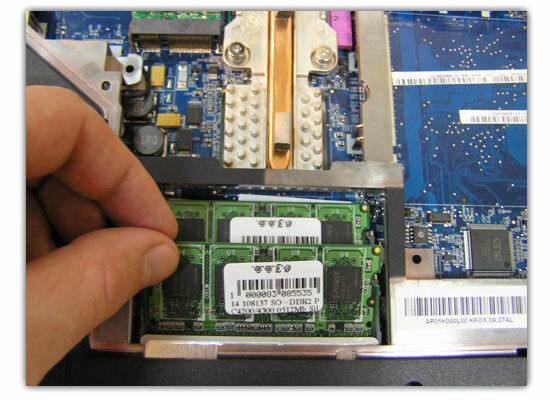 Often the owners of laptops there is the question of the replacement of RAM. It is very often just not enough. So you can not buy a new one, but simply to improve your existing laptop. To change the operational memory, you must first determine where it is located. Looking for this information in the manual to the laptop or the Internet. Often, the operational memory of hiding cover, which is on the opposite side of the device. But in some models the memory can be under the keyboard or near the motherboard. In this case, you will have to partially disassemble the laptop. If the slots for the memory modules are at the bottom, and they closed the lid, then just take a screwdriver and Unscrew the bolts. Previously remove the battery. Then take out the plastic cover. We may see one or more memory modules SO-DIMM or SO-SIMM. These are the analogues of memory for desktop PCs only cropped length. Move aside the clips and gently remove the modules. Then in the same way set a new and fasten the lid. Ready. If the operational memory is under the keyboard or near the motherboard, it will be a little difficult. Have to disassemble the laptop. Most often, the disassembly process starts with the front panel. Remove the battery, Unscrew the bolts that hold the panel. Then turn over the laptop and remove the panel. We will be the bolts that hold the keyboard. Unscrew them, move the keyboard. If you want to take it off completely, you will need to disconnect the ribbon cable that goes to the motherboard. Next, look for steel panel that hides the operational memory. Unscrew the screws and remove. Here we got to the memory. Now move the retaining clips and gently pull the modules. Then in their place put new RAM memory. All actions are performed in reverse order. Important in the process of replacing the RAM is not in a hurry. And be sure to remove the battery. Because RAM is sensitive to static electricity, it can easily be damaged if the battery is connected to the laptop. Keep calm and remove the RAM carefully so as not to damage the small contact group.